The long wait for Square Card Sleeves is over! 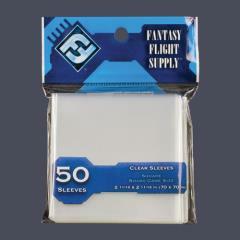 Players have expressed their desire to sleeve cards for games such as Power Grid , Catan Card Game , and The Rivals for Catan , and Fantasy Flight Supply has responded. Square Card Sleeves measure 2 11/16 x 2 11/16 in (70 x 70 mm), meaning they fit cards from the aforementioned games nice and snugly, as well as other cards of similar size.